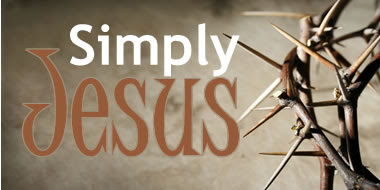 I started work on some graphic pieces and the like for our teaching series starting in July - Simply Jesus. About 100 films have been made about Jesus. Most recently Mel Gibson's The Passion of the Christ and The Da Vinci Code. It seems that Jesus is still big news. He has even appeared on TV series like The Simpsons and South Park. We want to look again at what the Bible has to simply say about Jesus. Read more about the series here. During the months of July & August we will be asking you to read through the first 4 books of the New Testament: Matthew, Mark, Luke & John detailing the life of Jesus. I will be posting a devotion each day based on the life of Jesus. Come back then.